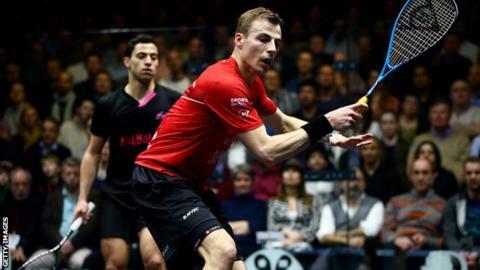 England's Nick Matthew remains on course to end his career with a tournament victory having reached the last four of the World Series Finals. Matthew, 37, had retired after the British Open, but was drafted into the season-ending tournament in Dubai when Marwan ElShorbagy pulled out. He beat Miguel Angel Rodriguez 11-9 9-11 12-10 to progress from Group A.
Egyptian number one seed Mohamed ElShorbagy also went through, beating countryman Tarek Momen. Matthew and ElShorbagy, who have won both of their games so far, face each other in their final group game on Thursday.